Oh yeah! 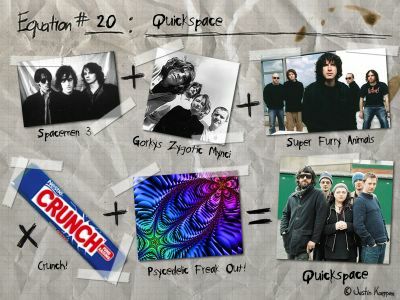 Quickspace! If you've ever heard them before that's probably what's going through your head about now. Yes, Quickspace..... what is there to say about them? They sound like crunchy, doped up nursery rhymes with chirping electronics and spazzy guitar noodles. But the good kind. I bought this album on a whim one day at a record store and promptly never listened to it, then about a year ago I dusted it off and gave it a shot. I liked it now, who knew? I guess at the time I wasn't ready for it but since my taste has expanded to include trippy, repetative post-rock meanderings like Mogwai, Super Furry Animals and Bent Leg Fatima I guess they fit right in there. Not really the most revolutionary of their contemporaries, but enjoyable and quirky nonetheless. Looks like money well spent. This is awesome. Glad I stumbled across this fine site. Now I have new bands to check out. Cheers. the pictures are awesome. if u dont mind telling, what software ur using?